Bhasin Sons Pvt. 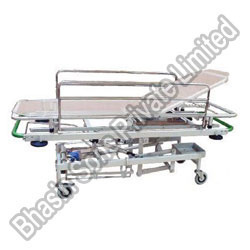 Ltd is one of the leading names in the field of manufacturing and exporting Emergency Recovery Trolley all over the world. These trolleys are complexly structured with adjustable backrest and the height is adjusted by the foot using hydraulic pump. The telescope IV rod along with the stainless steel side rails makes these products ahead. We prefer these structures for operation theaters.